A beautifully light interior designed upper ground floor flat within this attractive and quietly positioned period terrace. It has good ceiling height and a particularly nice bay fronted reception room to the front - and a well planned kitchen with aspect over gardens at the back. The property is located just off Askew Road on the west side. Askew Crescent's south facing gardens adjoin those of St Elmo Road and create a surprisingly leafy and peaceful aspect for this flat's bedroom and kitchen. It is minutes from the local shops, restaurants and bus routes on Askew Road and Uxbridge Road as well as within easy reach of Westfield. Stamford Brook (District Line Tube), and further Shepherd's Bush (Central,Circle and Hammersmith & City Line Tubes) are also all close at hand. 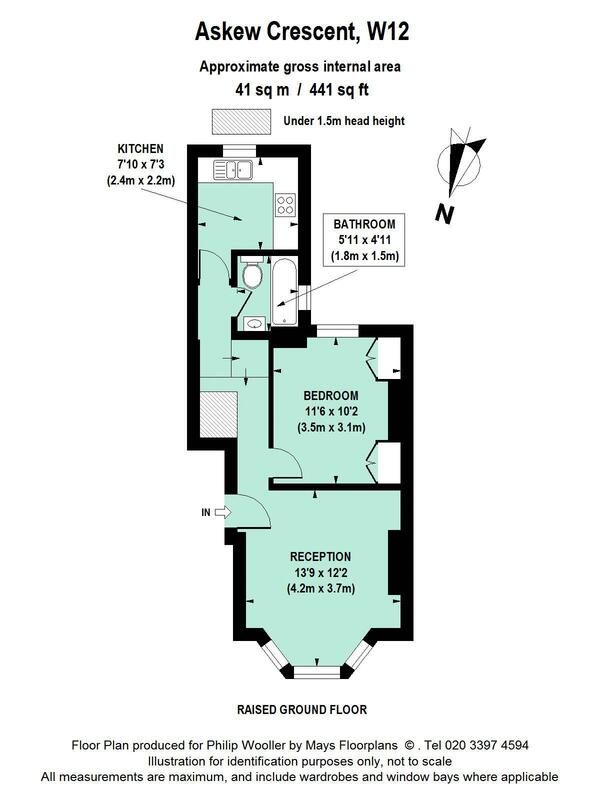 441 sq ft / 41 sq m approx.